Is there anything more rock and roll than tea? Umm. Well, if the truth be told, tea is probably still suffering from something of an image problem. You know the one — elderly women in festive hats gathering in stuffy tea houses to drink so-so tea and eat those little sandwiches with the crusts removed. Which still happens, now that you mention it, but tea has been undergoing something of an upgrade in its image of late, and it can’t hurt this makeover that several members of the rock and roll community have opened, or are planning to open, tea houses and tea shops. Take Moby, for instance, who’s probably the member of this tiny group of tea sellers with the longest standing. 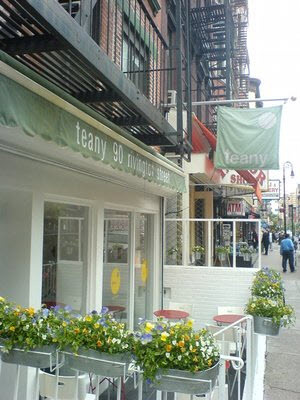 In 2002, the popular electronic musician opened Teany, a café and restaurant on Manhattan’s Lower East Side. A reflection of the musician’s vegan lifestyle, Teany began by offering a range of tea and vegan foods and later branched out with their own line of bottled tea. Brian Ritchie is not exactly a household name, unless you live in a household that favors so-called alternative rock, including the type popularized by the likes of the Violent Femmes. The “Grandfathers of Folk-Punk” (one of the catchy monikers listed at their web site), the group was founded in 1980 and are apparently still going strong. However Ritchie, who eventually branched out and became a certified instructor of the Japanese flute, relocated to Hobart, Tasmania in the 2000s and opened a tea house called Chado The Way of Tea. More on that venture in this Fast Company article.